Mrs. Monica Valerio and her fifth grade class. The fifth graders at Goshen Elementary received a grant from Utah Valley University to go see the play, Wiley and the Hairy Man. Students enjoyed the production and were able to practice their writing skills as they wrote thank you letters to Utah Valley University. Goshen Elementary wants to thank Grandma Chatwin for all of her time she gives to students to help them succeed. Grandma Chatwin was recognized at a banquet and received a plaque for serving 20 years as a volunteer in the Foster Grandparent Program. All of those years were as a volunteer at Goshen Elementary in the kindergarten classes. The students in Mr. Jason Dickie's second grade class were picked for the second time this year as the winner of the Goshen Elementary School spirit contest. 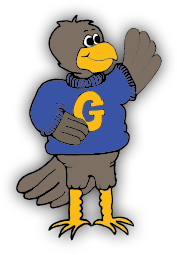 The contest is judged on the percentage of students wearing the school colors of gold (yellow) and blue. The second graders are holding up two fingers to show how many times they have won the contest this year. Fourth grade students at Goshen Elementary were all dressed up on September 14 to go and hear the Utah Symphony perform. Students enjoyed seeing the instruments used to play some familiar songs they knew from movies. The conductor showed students how songs can tell a story. Thanks for a great performance Utah Symphony! Alexys Palmer reading with her first grade reading buddies Ella Burningham and Sky Simmons. Goshen Elementary is participating in the Road to Success program again this year. Students are already reading to earn their reading tickets so they can win bikes and other awards through the year. This year the program is giving away a bike every term! Keep up the reading students. Goshen Elementary students were excited to return to school this year and meet their new principal and new teachers. The students could hardly wait for recess because of the new playground that was put in this summer. The playground was built with money from the bond passed last election.